A controller's primary task is to separate certain aircraft — to prevent them from coming too close to each other horizontally and vertically. Secondary tasks include ensuring orderly and expeditious traffic flow and providing advisories, such as weather information and navigation directions (vectors). In many countries, ATC services are provided throughout the majority of airspace, and its services are available to all users (private, military, and commercial). When controllers are responsible for separating some or all aircraft, such airspace is called "controlled airspace" in contrast to "uncontrolled airspace." Depending on the type of flight and the class of airspace, ATC may issue instructions that pilots are required to follow, or merely advisories to assist pilots operating in the airspace. In all cases, however, the pilot has final responsibility for the safety of the flight, and may deviate from ATC instructions in an emergency. Air traffic control services can be divided into two major subspecialties, terminal control and en-route control. Terminal control includes the control of traffic (aircraft and vehicles) on the airport surface and airborne aircraft within the immediate airport environment. Generally, this is approximately a 30 to 50 nautical mile (56 to 93 km) radius of the airport, from the surface to about 10,000 ft (about 3,050 m). Terminal controllers work in facilities called control towers and terminal area control (called Terminal Radar Approach Control, or TRACON, in the U.S.). At some locations, controllers are shared between tower control and the terminal area control, while at others the tower and the terminal area control are completely separate entities. For example, Philadelphia International Airport is served by a combined ("up/down") facility, while Chicago's O'Hare Airport is served by a control tower at the airport, and a remote TRACON located at Elgin, Illinois. En-route controllers control the traffic between the terminals. They can also control traffic in and out of airports where the traffic volume does not warrant the establishment of a terminal ATC operation. En-route controllers work at facilities called Area Control Centers or Air Route Traffic Control Centers. The primary method of controlling the immediate airport environment is visual observation from the control tower. 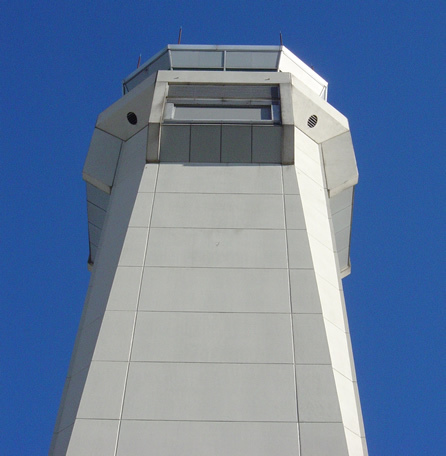 The tower is a tall, windowed structure located on the airport grounds. Tower controllers are responsible for the separation and efficient movement of aircraft and vehicles operating on the taxiways and runways of the airport itself, and aircraft in the air near the airport, generally 2 to 5 nautical miles (4 to 9 km) depending on the airport procedures. Radar displays are also available to controllers at some airports. Controllers may use a radar system called Secondary Surveillance Radar also known as Airport Surveillance Radar for airborne traffic approaching and departing. These displays include a map of the area, the position of various aircraft, and data tags that include aircraft identification, speed, heading, and other information described in local procedures. The areas of responsibility for tower controllers fall into three general operational disciplines; Ground Control (Ground Movement Control, or GMC in the U.K.), Local Control (Tower in North America), and Clearance Delivery (Planner in the U.K.) -- other categories, such as Apron Control, may exist at extremely busy airports. While each tower's procedures will vary and while there may be multiple teams in larger towers that control multiple runways, the following provides a general concept of the delegation of responsibilities within the tower environment. Ground Control (sometimes known as Ground Movement Control) is responsible for the airport "movement" areas, or areas not released to the airlines or other users. This generally includes all taxiways, holding areas, and some transitional aprons or intersections where aircraft arrive having vacated the runway and departure gates. Exact areas and control responsibilities are clearly defined in local documents and agreements at each airport. Any aircraft, vehicle, or person walking or working in these areas is required to have clearance from the ground controller. This is normally done via VHF radio, but there may be special cases where other processes are used. Most aircraft and airside vehicles have radios. Aircraft or vehicles without radios will communicate with the tower via aviation light signals or will be led by vehicles with radios. People working on the airport surface normally have a communications link through which they can reach or be reached by ground control, commonly either by handheld radio or even cell phone. Ground control is vital to the smooth operation of the airport because this position might constrain the order in which the aircraft will be sequenced to depart, which can affect the safety and efficiency of the airport's operation. Some busier airports have systems, such as, ASDE-3, AMASS or ASDE-X, designed to display aircraft and vehicles on the ground. These are used by the ground controller as an additional tool to control ground traffic, particularly at night or in poor visibility. There are a wide range of capabilities on these systems as they are being modernized. Older systems will display a map of the airport and the target. Newer systems include the capability to display higher quality mapping, radar target, data blocks, and safety alerts. Local Control (most often referred to as the generic "Tower" control, although Tower control can also refer to a combination of the local, ground and clearance delivery positions) is responsible for the active runway surfaces. Local control clears aircraft for take off or landing and ensures the runway is clear for these aircraft. To accomplish this, local control controllers are normally given 2 to 5 nautical miles (4 to 9 km) of airspace around the airport, allowing them to give the clearances necessary for airport safety. If the local controller detects any unsafe condition, a landing aircraft will be told to "go around" and will be re-sequenced into the landing pattern by the terminal area controller. Within the tower, a highly disciplined communications process between local and ground control is an absolute necessity. Ground control must request and gain approval from local control to cross any runway with any aircraft or vehicle. Likewise, local control must ensure ground control is aware of any operations that impact the taxiways and must work with the arrival radar controllers to ensure "holes" in the arrival traffic are created (where necessary) to allow taxiing traffic to cross runways and to allow departures aircraft to take off. Crew resource management procedures are often used to ensure this communication process is efficient and clear. Clearance delivery (sometimes known as Planner) is the position that coordinates with the national command center and the en-route center to obtain releases for aircraft. Under normal conditions, this is more or less automatic. When weather or extremely high demand for a certain airport become a factor, there may be ground "stops" (or delays), or re-routes to ensure the system does not get overloaded. The primary responsibility of the clearance delivery position is to ensure that the aircraft have the proper route and release time. This information is also coordinated with the en-route center and the ground controller in order to ensure the aircraft reaches the runway in time to meet the release time provided by the command center. Larger airports have a radar control facility that is associated with the control tower. In most countries, this is referred to as Terminal Area Control; in the U.S., it is often still referred to as a TRACON or Terminal Radar Approach CONtrol facility (sometimes referred to as Approach or Departure control). While every airport varies, terminal controllers usually handle traffic in a 30 to 50 nautical mile (56 to 93 km) radius from the airport and from the surface up to 10,000 feet. The actual airspace boundaries and altitudes assigned to a TRACON are based on factors such as traffic flows and terrain, and vary widely from airport to airport. Terminal area controllers are responsible for providing all ATC services within their airspace. Traffic flow is broadly divided into departures, arrivals, overflights, and VFR aircraft. As aircraft move in and out of the terminal airspace, they are handed off to the next appropriate control facility (a control tower, an en-route control facility, or a bordering terminal area control). Terminal is responsible for ensuring that aircraft are at an appropriate altitude when they are handed off, and that aircraft arrive at a slow enough rate to permit safe landing times. Not all airports have terminal area control available. In this case, the en-route center will coordinate directly with the tower and provide this type of service where radar coverage permits. Under these circumstances, the separation minimums are usually increased. ATC provides services to aircraft in flight between airports as well. The level of service is dependent on the type of flight the aircraft falls under (IFR or VFR), the type of airspace the aircraft is in and the services requested by the pilots. En-route Air Traffic Controllers issue clearances and instructions for airborne aircraft, and pilots are required to comply with these instructions. Controllers adhere to a set of separation standards that define the minimum distance allowed between aircraft. These distances vary depending on the equipment and procedures used in providing ATC services. Pilots fly under one of two sets of rules for separation; Visual flight rules (VFR) or Instrument flight rules (IFR). Air Traffic Controllers have different responsibilities to aircraft operating under the different sets of rules. Pilots flying under VFR assume responsibility for their separation from all other aircraft and are not assigned routes or altitudes by ATC (outside of positive control airspace). They fly on their own using a "see and be seen" separation criteria. In busier controlled airspace, VFR aircraft are required to have a transponder. This amplifies the radar signal (as well broadcasting altitude level and a transponder code), and is used to allow controllers to warn IFR aircraft of any potential conflict. Governing agencies establish strict VFR "weather minima" for visibility, distance from clouds, and altitude to ensure that VFR pilots can be seen from a far enough distance. VFR pilots can request, and ATC can elect to provide "VFR Advisory Services," if the controllers' workload permits. This is also referred to as "Flight following." Under this environment, the controllers will radar identify the VFR aircraft and provide traffic information and weather advisory services for the VFR pilot. Controllers do not provide any instructions concerning direction of flight, altitude, or speed to the VFR pilot receiving advisory services, and they do not provide separation services. This is an optional service and may be discontinued by ATC or the pilot at any time. Pilots flying under IFR in controlled airspace typically file a flight plan with ATC and accept any revisions ATC requests to their route or altitude. In return, controllers will ensure that pilots flying IFR are separated from all other IFR aircraft and terrain by the appropriate minimum separation, either through radar services or by tracking flights through mandatory radio reports from pilots. The IFR pilot, however, must maintain a close watch for VFR aircraft since ATC may have no control over these aircraft, depending on the altitude and the class of airspace. In many areas, VFR aircraft are restricted to lower altitudes (typically below 18,000 feet MSL in the U.S.) and must have an operating transponder in congested airspace. In some countries, all aircraft, VFR or IFR, must operate under positive ATC control. En-route air traffic controllers work in facilities called Area Control Centers, each of which is commonly referred to as a "Center". The United States uses the equivalent term Air Route Traffic Control Center (ARTCC). Each center is responsible for many thousands of square miles of airspace (known as a Flight Information Region) and for the airports within that airspace. Centers control IFR aircraft from the time the aircraft departs an airport or leaves the terminal area's airspace or until the aircraft approaches the airspace controlled by a terminal area or if the airport does not have terminal area control, until the aircraft lands. Centers may also "pick up" aircraft that are airborne and integrate them into the IFR system. These aircraft must, however, remain VFR until the Center provides a clearance. Center controllers are responsible for climbing the aircraft to their requested altitude while, at the same time, ensuring that the aircraft is properly separated from all other aircraft in the immediate area. Additionally, the aircraft must be placed in a flow consistent with the aircraft's route of flight. This effort is complicated by cross traffic, severe weather, special missions that require large airspace allocations, and traffic density. As an aircraft reaches the boundary of a Center's control area it is "handed off" to the next Area Control Center. This "hand-off" process is simply a transfer of identification between controllers so that air traffic control services can be provided in a seamless manner. Once the hand-off is complete, the aircraft is given a frequency change and begins talking to the next controller. This process continues until the aircraft is handed off to a terminal area controller ("approach"). Since centers control a large airspace area, they will typically use long range radar that has the capability to see aircraft within 200 nautical miles (370 km) of the radar antenna. They may also use TRACON radar data to control when it provides a better "picture" of the traffic or when it can fill in a portion of the area not covered by the long range radar. Centers also exercise control over traffic travelling over the world's ocean areas. These areas are also FIRs. Due to the fact that there are no radar systems available for oceanic control, oceanic controllers provide ATC services using "non-radar" procedures. These procedures use aircraft position reports, time, altitude, distance, and speed to ensure separation. Controllers record information on flight progress strips and in specially developed oceanic computer systems as aircraft report positions. This process requires that aircraft be separated by greater distances, which reduces the overall capacity for any given route. Some Air Navigation Service Providers (e.g Airservices Australia, Alaska Center, etc.) are implementing Automatic dependent Surveillance - Broadcast (ADS-B) as part of their surveillance capability. This new technology reverses the radar concept. Instead of radar "finding" a target by interrogating the transponder, ADS transmits the aircraft's position several times a second. ADS also has other modes such as the "contract" mode where the aircraft reports a position based on a pre-determined time interval. This is significant because it can be used where it is not possible to locate the infrastructure for a radar system (e.g. over water). Computerised radar displays are now being designed to accept ADS inputs as part of the display. As this technology develops, oceanic ATC procedures will be modernised to take advantage of the benefits this technology provides. The day-to-day problems faced by the air traffic control system are primarily related to the volume of air traffic demand placed on the system, and weather. Several factors dictate the amount of traffic that can land at an airport in a given amount of time. Each landing aircraft must touch down, slow, and exit the runway before the next crosses the end of the runway. This process requires between one and up to four minutes for each aircraft. Allowing for departures between arrivals, each runway can thus handle about 30 arrivals per hour. A typical large airport with two arrival runways can thus handle about 60 arrivals per hour in good weather. Problems begin when airlines schedule more arrivals into an airport than can be physically handled, or when delays elsewhere cause groups of aircraft that would otherwise be separated in time to arrive simultaneously. Aircraft must then be delayed in the air by holding over specified locations until they may be safely sequenced to the runway. Up until the 1990s, holding was a common occurrence at airports. Advances in computers now allow controllers to predict transit times and sequence planes hours in advance. Thus, planes may be delayed before they even take off, or may reduce power in flight and proceed more slowly in order to fit perfectly into a landing sequence without holding. Beyond runway capacity issues, weather is a major factor in traffic capacity. Rain or ice and snow on the runway cause landing aircraft to take longer to slow and exit, thus reducing the safe arrival rate and requiring more space between landing aircraft. This, in turn, increases airborne delay for holding aircraft. If more aircraft are scheduled than can be safely and efficiently held in the air, a ground delay program may be established, delaying aircraft on the ground before departure due to conditions at the arrival airport. In ACCs, a major weather problem is thunderstorms, which present a variety of hazards to aircraft. Aircraft will deviate around storms, reducing the capacity of the en-route system by requiring more space per aircraft, or causing congestion as many aircraft try to move through a single hole in a line of thunderstorms. Occasionally weather considerations cause delays to aircraft prior to their departure as routes are closed by thunderstorms. Much money has been spent on creating software to streamline this process. However, at some Area Control Centers, air traffic controllers still record data for each flight on strips of paper and personally coordinate their paths. In newer sites, these flight progress strips have been replaced by electronic data presented on computer screens. As new equipment is brought in, more and more sites are upgrading away from paper flight strips. A prerequisite to safe air traffic separation is the assignment and use of distinctive call signs. By default, the callsign is the registration number (tail number) of the aircraft, such as "N12345" or "CG-ABC". For scheduled flights, military flights, and some other flights, the operators obtain permission to use an airline call sign followed by a flight number, instead of a registration number. In this arrangement, an identical call sign might well be used for the same scheduled journey each day it is operated, even if the departure time varies a little across different days of the week. The call sign of the return flight often differs only by the final digit, from the outbound flight. Generally, airline flight numbers are even if eastbound, and odd if westbound. In air traffic control terminology, a block of airspace of predetermined size assigned to a radar air traffic controller is called a "sector". Depending on various factors (traffic density, etc. ), a controller may be responsible for one or more sectors at any given time. Many technologies are used in air traffic control systems. Primary and secondary radar are used to enhance a controller's "situational awareness" within his assigned airspace — all types of aircraft send back primary echoes of varying sizes to controllers' screens as radar energy is bounced off their skins, and transponder-equipped aircraft reply to secondary radar interrogations by giving an ID (Mode A), an altitude (Mode C) and/or a unique callsign (Mode S). Certain types of weather may also register on the radar screen. Other correlations with electronic flight plans are also available to controllers on modern operational display systems. Conflict Alert (CA): a tool that checks possible conflicting trajectories and alerts the controller. Final Approach Spacing Tool (FAST) gives aircraft a runway assignment that the Approach Controller will give to the aircraft. FAST can also suggest vectors for downwind and base with the correct timing. User Request Evaluation Tool (URET) takes paper strips out of the equation for En Route controllers at ARTCC's. By providing a display that shows all aircraft in or entering the sector. Provides conflict resolution up to 30 minutes in advance.